Hang-Up Gallery are pleased to present their upcoming group show ‘Wall To Wall’ – a modern exploration of street art’s diverse nature. Following the steady progression of the movement from the urban surface(s) to the white gallery walls, the show willfeature eclectic mix of rare and unseen original works and limited editions from some of the finest and most exciting inthe scene such as: Banksy, KAWS, Faile, Swoon, Futura, Matt Small, Shepard Fairey, David Choe and Ben Eine. 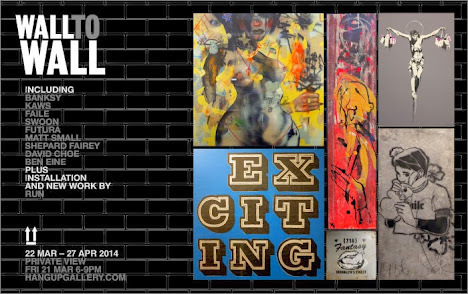 The downstairs room will feature the gallery’s first Street Art installation by celebrated Italian artist RUN, who will beholding his first solo show at Hang-Up Gallery in June 2014. The main gallery space will recreate the organised chaos of a street artist’s studio to intensify the viewing experience. Expect to see paint splattered walls, empty spray paint cans, collage material cuttings and tools of the craft transportingthe viewer deep into the creative process of how and where art is made. 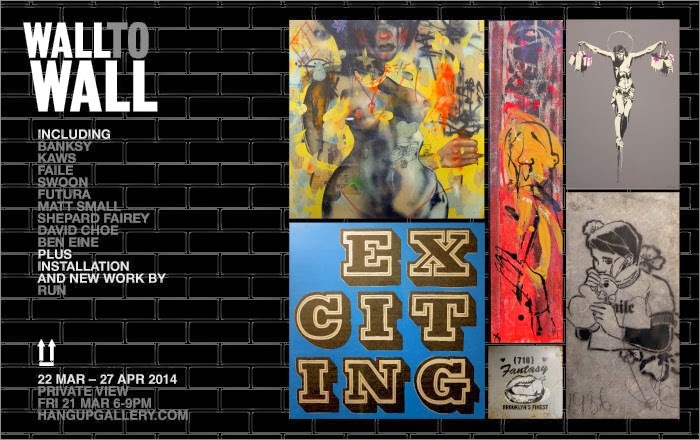 The exhibition will explore the multilayered aesthetic of street art to create a fuller appreciation of the art form.